The past three production seasons have given us an interesting trend in terms of production volumes across all grains and oilseeds in South Africa. With particular reference to wheat, the changes in the production trend was mainly due to the change in climate, where in the 2014/2015 production year the industry experienced widespread drought, to average rainfall in the previous production season and then recently another dry spell, particularly in the Western Cape in the 2016/2017 production season. In the 2017/2018 marketing season, which is the current marketing season, wheat production is estimated to reach 1,655 million tons. Areas planted to wheat only declined by 3,3% however, production is expected to decline by 13,4% from the previous production season, which yielded a total of 1,9 million tons. The decline in production this season was mainly caused by inadequate rainfall in the Western Cape. Due to below average rainfall and very low soil moisture in some parts of the Western Cape, a large variation in the condition of the crop existed, effectively affecting overall yields. Over the years, local wheat production has declined considerably, resulting in the country relying on imports in order to meet local demand of 3,1 million tons. Therefore, it is no surprise, that in the current season with low production volumes, South Africa is likely to increase its import requirements in order to meet total domestic demand. Table 1 indicates the different changes expected in the current season, in comparison to the two previous seasons from 2015/2016 ton 2017/2018. It is likely that wheat imports could increase to 2 million tons in the current season, compared to 934 000 tons in the previous season. This would be the second highest level of wheat imports since the drought in the 2015/2016 marketing year. From the above data it is clear that the results from the recent drought experienced in the Western Cape, posted a similar trend as the wide spread drought experienced in the 2015/2016 season, which was labelled as the worst drought in over 100 years. It is also clear that wheat producers in the Western Cape have been hampered by a number of challenges in the years gone past as a result of climate change. Looking ahead, it is expec­ted that the trend of import increase may continue until farmers can have access to better seed technology that is more resilient to changing climate. 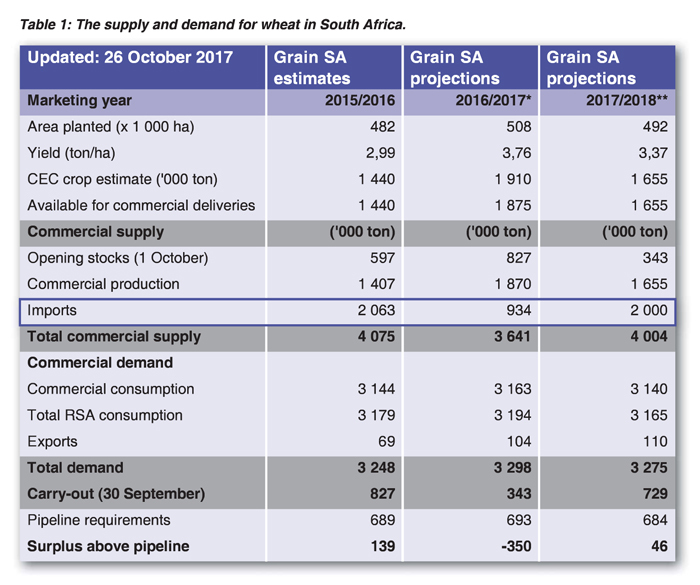 Article submitted by Michelle Mokone, Agricultural Economist: Grain SA. For more information, send an email to Michelle@grainsa.co.za.